It is quite annoying to download the whole 1Gb archive of SRTM30 DEMs when you need only couple of dozens of them. In case of Leningrad region for example I had to download 4 archives and face necessity of finding needed DEMs amongst several thousands(!!!) of files and deletion the rest... Too tedious and too long task to do it manually. Lets optimise it! We will use QGIS and Linux (I prefer openSUSE) console (and a text editor of your choice). The algorithm is applicable to other similar issues too. Firstly we will get the list of names of files that we need to save (for our actual project). Collect all DEMs from archives in a single folder. 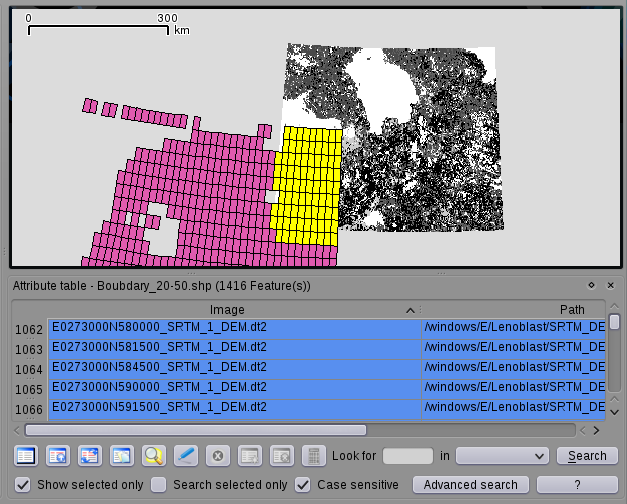 And use Image Boundary plugin (or Raster tile index from "Raster" menu) to create a polygon shp-file with borders of all the DEMs from the folder and corresponding file name and path. Now you can either to "save selection as" CSV from the layer menu or "copy selected rows to clipboard" from attribute table and paste it to the empty text-file. In LibreOffice Calc (or use other text editor for this) delete all columns exept that which contains file names and add to the list name of the text-file itself (lets name it FILELIST). NOTE: this file should contain ONLY NAMES without paths. Place this file to the directory with DEMs. Where FILELIST is our text-file containing names of files that we need to KEEP. This command will delete all files from the folder except files which names are listed in FILELIST.